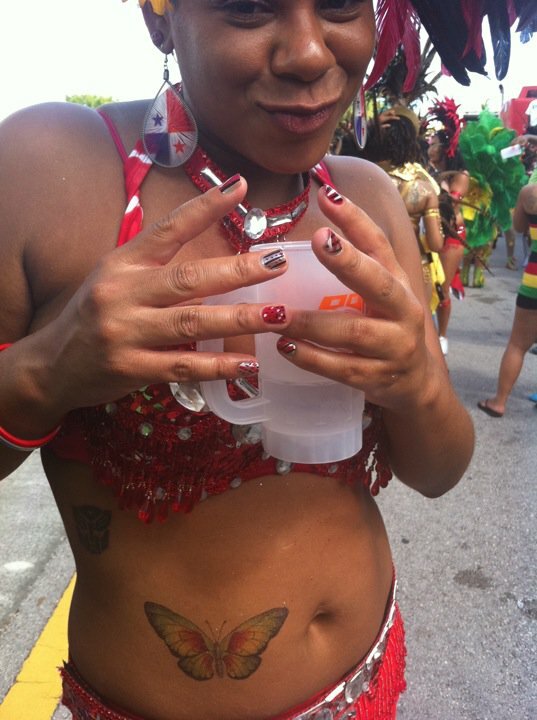 Miami Carnival was awesome, best 5 days of 2010. Wishing I could have brought my good camera to capture some real photos but it would have been hard to play mas & play paparazzi. And we know people luv to throw water so it was best to bring my waterproof camera even though it doesn’t capture the best images. I was able to capture a few half way decent pictures for my library. When I’ve played mas in the past I never get to see the other bands because Im with my band ALL day & by the time we pass the judges, eat & rest for a few all the other bands have split up. This year I was determined to see EVERYTHING. I ran to the back of the parade line while stopping to dance, record & photograph all the beautiful masqueraders, then came back to my band to drink and dance. Then I ran to the front while stopping to dance, record & photograph all the beautiful masqueraders, then came back to my band to drink and dance. While I love love love all the beautiful, barely there costumes & admiring the creativeness of each band, the thing I love the most about carnival is the steel pan & all the children in their costumes, both really touch my heart. My chica & I were in red were "suppose" to be in the orange & green section but "what had happen wuz"... Apparently no one was monitoring the costumes & they were ransacked by people who ordered the wrong sizes so ours were swiped. So sad because I had matching nail polish, jewelry, make up & the FRESHEST matching shoes and etc etc etc. But the most important thing was to play mas so we sucked it up and made it work. Being on the sideline carnival day is no fun. I soaked up alot of sun after dancing in the blazing heat for 8 hours carnival Sunday & I managed to hit the beach & pool several times during my trip which was great since its getting cold back home in Atlanta, but not so great in the aspect that I don’t tan well. Now I just look dirty, like that kid Pig Pen in the Peanuts Gang. Maybe I can just tell people that I’m from New Jersey, orange people are “in” up there right? 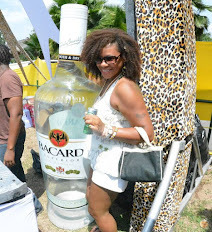 Now if I can only make Trinidad carnival happen... anyone want to buy a kidney or raggedy liver?!? 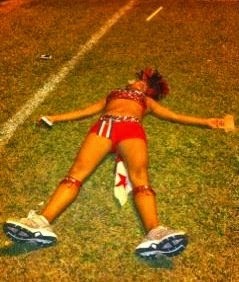 !﻿ I must say that there is nothing I enjoy more than playin mas. Such a great feeling dancing all day with friends & family & stopping for hugs with everyone that has your flag.